Home Games WATCH: Wafku the Animated Series now in Toonami! WATCH: Wafku the Animated Series now in Toonami! If you’re a big fan and avid player of Massively Multiplayer Online Role-Playing Games, then you probably must have come across Ankama Games‘ stellar fantasy turn-based game Wafku – which is set 1,000 years after the events of the MMORPG game Dofus, and features a world where adventures await and the quest to defeat the ogre known as “Ogrest” lies ahead for the characters. Now, everyone can see and experience the adventure first-hand in Toonami, as the network brings Wafku: The Animated Series to its viewers! Starting February 6, viewers in Hong Kong, Singapore, Philippines, Guam, Indonesia, and Mongolia can view this show that is sure to delight fans and players of the game, as well as attract new ones! In this trans-media animated adventure set in the same world as the game, the story focuses on Yugo, a 12-year old boy who resides in the small remote village of Emelka. Discovering that he has extraordinary powers and learning that he was adopted by his “father” Albert, Yugo sets out on a journey to discover his true parentage. He is accompanied by friends and companions who share in his adventures, and they will soon discover that the World of Twelve and its fate may rest on their shoulders. 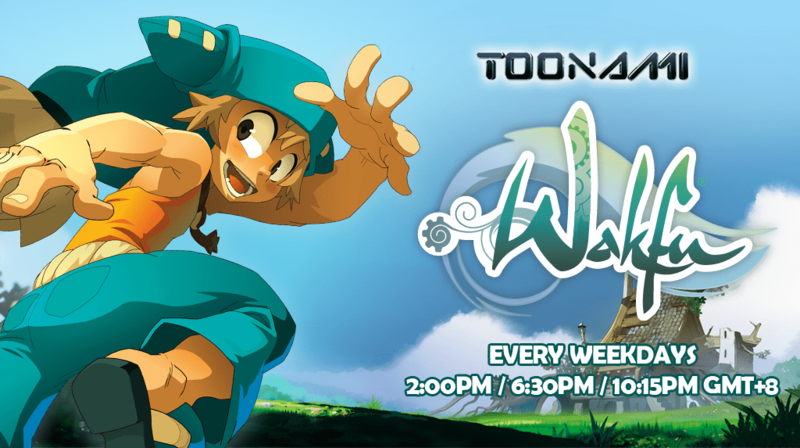 Wafku: The Animated Series airs every Monday to Friday at 2:00PM, 6:30PM, and 10:15PM in Toonami!